Musclepharm combined the best of real innovation to create Assault, the ultimate pre-workout with an advanced 5-stage delivery system. Assault helps fight fatigue, build muscle, and turn up the intensity with a multistage delivery system that addresses every angle of athletic performance. Take Assault before your workouts and competitions to experience enhanced strength, endurance, muscle mass, and training capacity. 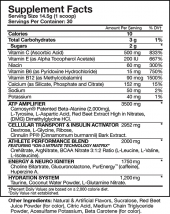 Assault is sports nutrition’s most complete pre-performance formulation. It starts with the ATP Amplifier system which features patented Beta-Alanine to buffer against lactic acid buildup and enhance muscular endurance. Next comes the Ion-3 Nitrate Technology Matrix that fuels more efficient vasodilation and muscle pumps. The Cellular Energy and Insulin Activator Blend create insulin to increase nutrient uptake by muscle cells, supporting greater anabolic growth and repair. Fuel your energy with the fourth stage of Assault, the Energy and Neuro Igniter fueled by a clean caffeine boost for explosive energy. Finally, rehydrate your system and repair your body with a restorative combination of electrolytes, coconut water, glutamine, and taurine. Fuel the athlete inside and experience the ultimate performance boost. It’s time to get leaner, faster, stronger, and harder with MusclePharm Assault. Suzuki Y, et al. High Level of Skeletal Muscle Carnosine Contributes to the Latter Half of Exercise Performance During 30-s Maximal Cycle Ergometer Sprinting. The Japanese Journal of Physiology. 52:2. (2002): 199-205. Bailey SJ, et al. Dietary Nitrate Supplementation Reduces the O2 Cost of Low-Intensity Exercise and Enhances Tolerance to High-Intensity Exercise in Humans. Journal of Applied Physiology. 107:4. (2009): 1144-1155. Greiwe JS, et al. Leucine and Insulin Activate p70S6 Kinase Through Different Pathways in Human Skeletal Muscle. American Journal of Physiology, Endocrinology, and Metabolism. 281:3. (2001): 466-471. Costill DL, et al. Effects of Caffeine Ingestion on Metabolism and Exercise Performance. Medicine and Science in Sports. 10:3. (1978): 155-158. Castell LM, Newsholme EA. The Effects of Oral Glutamine Supplementation on Athletes After Prolonged, Exhaustive Exercise. Nutrition. 13:7-8. (1997): 738-742. I think this works relatively well but I had such bad side effects I had to stop taking it. It makes me bloated and sometimes sick to my stomach. It might work better for others. This helped me get a few more reps in. The extra energy really pushes you to do a little more. No jittery feeling either, but I’m used to taking stuff for workouts. I haven’t taken this in the evening so I don’t know if it keeps you up or not. I’ve heard a lot of people complain about the flavor, but I don’t mind it because this product works for me. This product is the best one I’ve tried so far. This company is overprice this products. Every other place sell this for around $30 max. We apologize you were left with that impression. The great thing about eSupplements.com is we are never overpriced thanks to our “Low-Price Guarantee”. You can check out more details about that policy here. 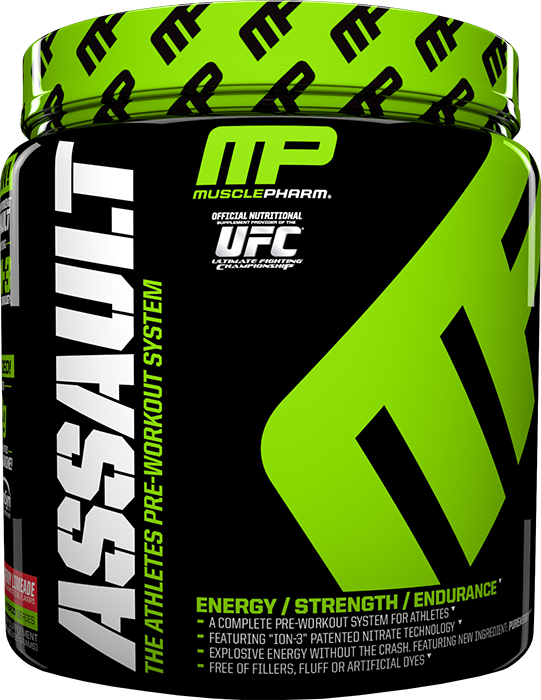 Please contact us so we can give you the best price out there for MusclePharm Assault. We would also love to hear more as to why you think MusclePharm Assault as a product deserves 1 out of 5 stars. Did you have a bad experience using it? We’ve tested and analyzed every major pre-workout supplement out there and MusclePharm Assault has always fared well. So much so that it was rated the 4th best pre-workout product in the industry on our ranking of the “10 Best Pre-Workout Supplements“. Where is the better price??? I was about to purchase this because in doing a quick search I couldn’t find anything that beats $28.99 + free shipping on the internet. But I decided to check around some more after seeing the comment above by Andy about it being overpriced. The only places I could find with a better price than $28.99 were places that charge shipping, making the total cost well over $30. I would love to know if there is a place with better prices. Were you looking at the price of the 20 servings size? I ended up buying here because I literally couldn’t find a better deal. I’ve learned you can’t take this in the morning on an empty stomach. I have been doing a scoop in the morning half hour before my work out (i have a 20 minute drive to the gym). by the time i get to the gym it’s kicking in and i’m ready to go! Then i’ve been working out after work as well and take a scoop before that workout. I find a great assistance in push from this product, No jittery feelings at all. I’ve taken C4 in the past and it made me feel like my heart was going to jump out of my chest, No such feelings with Assault. I’ve already recommended it to a few friends as a pre workout and would again. i’m almost done with my first tub of watermelon flavor, Thinking i’m going to pick up a different flavor here soon. it tastes great, no crash and no jitters, i would start off with half a scoop, then later move on to a full serving. Tastes great and a super great deal on this site! Good clean energy. No crazy, wires stim boost. Awesome pumps and focus. Clean. Tastes great. Creatine. What more could you want? Strawberry Margarita is by far the best. I’ve been using this for over a year in the mornings before cardio. It mixes well and the taste of pretty good, it gets you pumped for a workout. Only downside is it makes you a little itchy feeling for about 10 minutes but it doesn’t bother me. After having, shall we say, intestinal issues with most products with n.o, I started trying pre workouts that boasted crazy energy and no gut issues. Stimul8 was one. It was good, but pretty much every workout was cardio….because standing still is cardio on Stimul8. And forget sleep, that’s for people who don’t take Stimul8. Anyway, I wanted something a bit more controlled release, but still has the ability to carry me through a rigorous set. I found Assault to be just about perfect for me. By the time my workout is typically over, I feel like I can keep going. Which is great for pushing myself to the limit. Got it with a Bogo deal so that makes it even better. 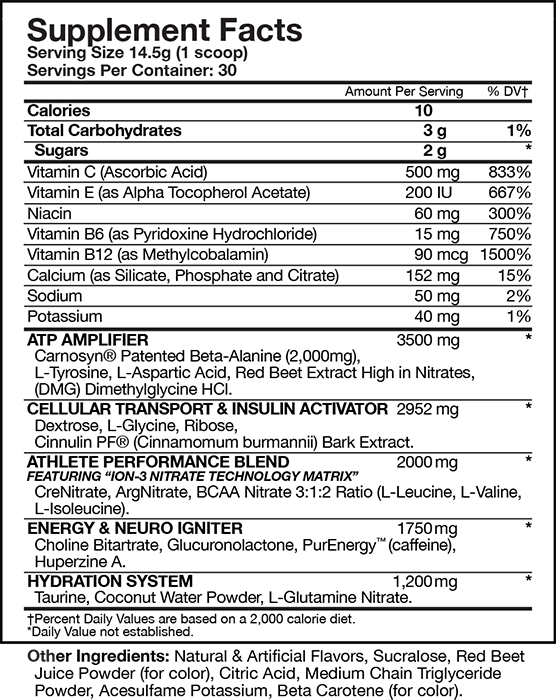 I am really beginning to fall in love with Musclepharm products. Has more in it than any other pre work out i have found on the market, taste is pretty good too. buying it again soon! 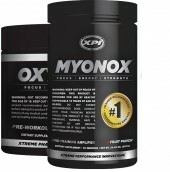 good taste, and definitely gives you the endurance and strength to power thru your workout. 1 scoop was pretty strong for me, kept me up for longer than normal so i cut back to half a scoop and still does the job. Will keep buying this product! Love this product and will use nothing else. 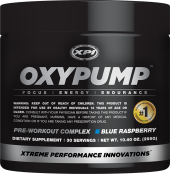 For me, this product is my pre workout of choice for the focus it gives me. It doesn’t irritate my stomach, tastes great, and is just the right amount of energy for me. Mixed easily with great flavor. Wonderful energy to power through. only good thing was there wasnt a crash but i wasnt focused nor felt energized. it also made me break out in hives. It gets me going when my mind wants to give up but my body keep asking for more. Ever since I tried this product, I feel great about working out. CarnoSyn Beta-Alanine – Assaults contains 2 grams of patented CarnoSyn Beta-Alanine which promotes carnosine levels, buffering lactic acid and enhancing performance via increased endurance. ArgNitrate – Assault is the only pre-workout system to deliver arginine in a special nitrate form that features ION-3 Nitrate technology. This allows arginine to more efficiently open up blood pathways to muscles and further amplifying strength, recovery, muscle mass, and athletic performance. Dextrose – This simple sugar spikes a rapid insulin response, especially when taken before, during, and after training sessions. Insulin is an anabolic hormone that enhances the uptake of amino acids and nutrients by muscles. PurEnergy – PurEnergy, a patented caffeine source, gives you lasting focus and energy that lasts up to 8 times longer than normal caffeine but without the negative side effects such as crash or jitters. Taurine – Taurine, an amino acid found in meat and fish, taurine works in combination with glutamine to improve electrolyte movement between cells and hydrate the body. Q. How Does Assault Specifically Address Performance? A. Assault contains a precise combination of powerful ingredients that increase ATP (energy production), enhance nitric oxide release for improved pumps and strength, improves insulin sensitivity for greater nutrient uptake by muscle cells, and delivers superior hydration to prevents cramps and fatigue. Q. What Other Aspects of Fitness Does Assault Address? A. Assault also focuses on recovery and post-workout anabolic growth. 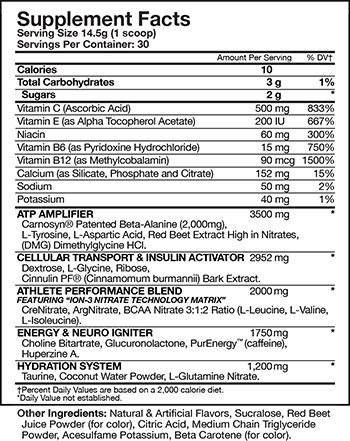 Its hydration blend restores nutrient stores and replenishes the body while igniting anabolic processes. Q. Does Assault Contain Creatine? A. Yes, Assault contains creatine nitrate, a highly bioabsorbable creatine that increases the body’s nitric oxide and ATP levels. Q. How Long Will it Take for Assault to Kick In? A. Assault will generally kick in within 20-30 minutes of consumption for a rush of energy, strength, and pumps. You will feel the effects of Assault for up to 3-4 hours after consumption as it continues to help you recover even after you’re done working out. Q. How Do I Take Assault? A. Mix ½ scoop in 12-16 oz of water. Drink 20-30 minutes before your workout. Q. What Are The Warnings? A. Do not exceed the recommended serving size. Only intended for healthy adults over the age of 18. Speak with your physician before use if you are pregnant, nursing, taking medication, or being treated for a medical condition.